Gift basket supplies begin with a quality gift basket bag. 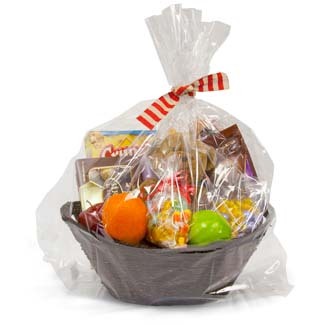 Used for fruit baskets, Easter baskets, gift baskets and many others, these gift cello basket bags can be oaded at the top and sealed with a ribbon, twist tie, or sticker. 1.6 Mil BOPP (Biaxially Oriented Polypropylene) have an excellent barrier of protection from moisture, gas, and aroma. Performance: Some products react to oxygen, while moisture is an issue for others. We recommend that you perform a shelf-life test. Only you know how your product should look and taste. We also recommend a thorough test of bag strength, appearance, label adherence and sealing.